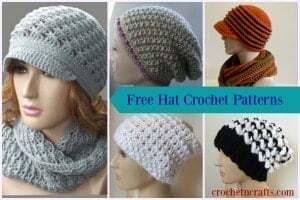 Here is another ornament crochet pattern. This one is done up with the picot stitch and a few other stitches to give you somewhat of a lacy edge. My pattern tester, Kathy, tested my flower ornament and she came up with a bunch of ideas on what to do with these. 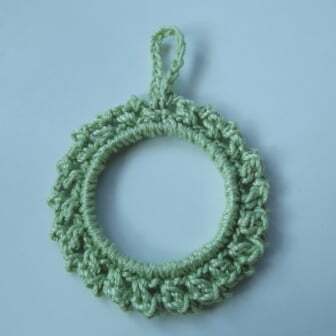 Some ideas include a picture frame, or attaching other embellishments to the center of the ring. Thank you so much Kathy for testing this…and so quickly! Also, thank you for allowing me share your ideas on how to use this with my readers. 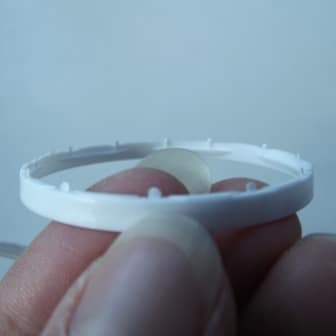 4.5cm Plastic Ring – I used a ring from a 4L water bottle, but any similar ring that size will work just as well. An exacto knife to trim the ring. If using the rings from water bottles, you’ll need to trim off these tabs with an exacto knife. Otherwise they’ll peak through the thread. Small Picot: Ch 2, sl st in first ch made. Rnd 2: Ch 1, (sc, dc, small picot) in same st as join, *sk next 2 sts, (sc, dc, small picot) in next st; rep from * around to last 2 sts, sk last 2 sts; join with sl st to first sc. Ch 15, sl st once more in first sc. FO.